For 30 years now the Taiwanese manufacturer Getac has been independently developing and producing robust notebooks, tablets and convertible computers which are protected against environmental influences. Getac is currently the second largest rugged manufacturer in the world, with over 8,280 employees, more than 20 operations worldwide, and a revenue of US$ 729 Mio (2017). Worldwide successful projects, with large numbers of items put to use in the most different sets of circumstances, confirm the high performance of these professional devices. Vertical markets ranging from defense and security to public safety, industry, utilities, healthcare, field service, automotive, transportation and logistics, in which users rely on dependable IT systems. Getac offers a high standard of quality and flexibility for integrations opportunities, as the design and delivery process is fully owned by Getac. The manufacturer calls on its own extensive technological product development and finishing resources. From design to production, Getac's rugged computers for industry use are strictly controlled to meet the most stringent international testing certification standards of the industry. Getac products are so rugged they are able to work in any environment, even in stormy weather, extreme temperatures, or an environment filled with dust. Getac products are designed to survive long-term exposure to vibration, showing perfect performance at every critical moment and helping users to ACHIEVE MORE in innovation and excellence. They are the first to introduce features such as the revolutionary LumiBond technology that offers an anti-reflection and high brightness panel, the LifeSupport hot-swappable battery technology for uninterrupted power suply and a filter-free night vision technology which complies with MIL-STD-3009. 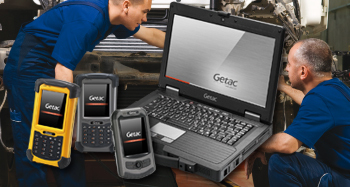 Furthermore Getac’s standard warranties for fully rugged products go beyond what you might expect. Bumper-to-Bumper is THE hassle-free guarantee, supported by the best Pack & Collect logistics service in Europe, and rapid repair and return by Getac’s in-house experts. With accidental damage now included in 3 or 5 year warranty packages, users are assured their units will be back up and running without the worry of additional cost or extended downtime, should the unexpected happen. You receive these rugged and semi-rugged notebooks, as well as the incredibly robust tablets directly from stock at Jarltech. Numerous devices are immediately available, including the accustomed high speed and service offers (which are profitable for you).